This post was one of my earliest in this blog. I’ve updated it to reflect both changes in my posting style and substantial improvements in available data. The 1982 Ford Mustang GT marked the return to form of America’s definitive pony car and ignited a second round of the power wars with the then brand new third generation Camaro and Firebird. Along with the new GT trim level, the new high output (H.O.) version of the venerable 4.9 liter/302 ci V8 was up to 157 bhp—quite an upgrade from 1981’s 4.2 liter/255 ci engine. Mustang GT page from the 1982 Ford Mustang brochure, linked from the Old Car Manual Project’s amazing brochures section. 157 bhp feels quaint in 2014 (the lowest horsepower engine for the 2015 Mustang is the 300 bhp 3.7 liter V6), but the 1981 Mustang had topped out at (oog…) 115 bhp and as tested 0-60 times in the 2,600 pound GT dropped by over 3 seconds for 1982. You could get the H.O. engine with any Mustang, but the hot setup was with the GT, which offered a four-speed manual transmission and a 3.08:1 rear axle ratio with Traction-Lok limited slip differential. Other options that were standard with the $8,308 GT (about $20,500 in today’s dollars) with the 302 were power steering and traction bars. The GT also received cast aluminum wheels, dual fog lamps, a forward-facing hood scoop, and the same spoiler initially featured on the first-year for the Fox-body Mustang 1979 Pace Car. 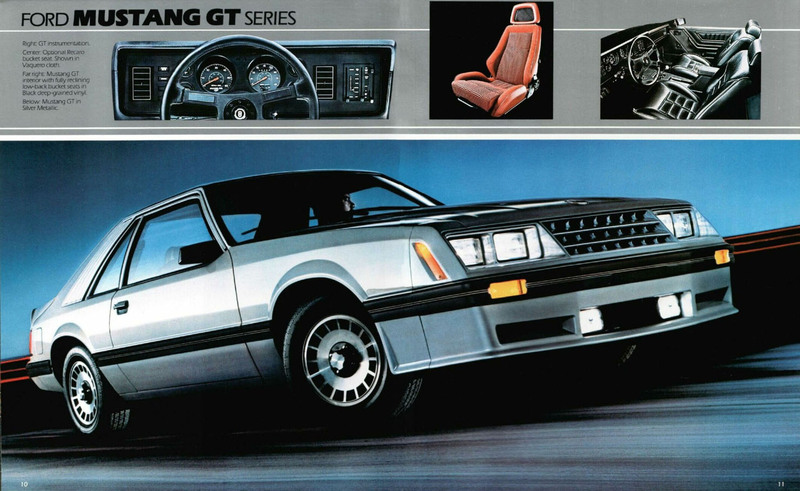 Options for the Mustang GT included air conditioning ($676), snazzy Recaro high-back bucket seats ($834), power windows ($165), and an AM/FM stereo with either 8-track or cassette player ($178)—it seems that 1982 was Ford’s crossover year for 8-track versus cassette. The Mustang GT shows up often in the Hemming’s Motor News classifieds. As I write this in August 2014, there are no 1982s, but there is a white 1985 with 28,000 miles on sale for $11,500. According to Hagerty’s valuation tools, all the money for an 1982 Ford Mustang GT in #1 condition is $14,700, with values sliding up. I only have four exterior color choices with a 1982 Mustang GT—make mine Bright Red, please.